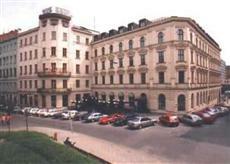 The Slavia Hotel Brno is located in the corner of the city. Guests will find that this is one of the closest Brno hotels to many attractions, including the Kino Jalta Cinema and Tugendhat Villa. There are also many museums throughout the area. The Slavia Hotel Brno is located only a short walk from the nearest bus station. Public buses offer easy access to attractions as well as to the Brno airport. The hotel offers easy access to the main road as well. Each of the guestrooms at the Slavia Hotel Brno offers wireless Internet access. Each room also includes a number of other four star amenities. All rooms are pet friendly and each contains a private bathroom. Guests of the Slavia Hotel Brno will find themselves within walking distance of many shops and restaurants. The hotel offers a complimentary breakfast buffet as well as a restaurant. There is a bar onsite as well as a sauna and a lovely lounge.